Limber Chest Used by Lynchburg, Va. Confederate Troops – This fine example of an original Civil War limber chest was recently removed from the c. 1850s home of John Winston Ivey, by Ivey’s great grandson. (A letter corroborating the origins of the chest, signed by Mr. Ivey’s grandson, will accompany the chest.) The limber chest has been in the Ivey home since the Civil War. Mr. John Winston Ivey served in the 11th Va. Infantry, until he was wounded, at the onset of the war, during skirmishes surrounding the Battle of Williamsburg. 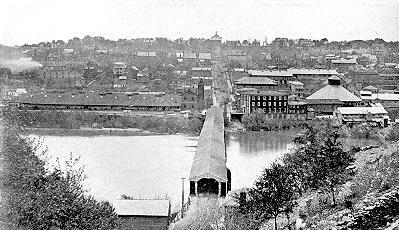 Ivey, due to his wounds, would not return to active, field service; in lieu of field service, Ivey, having returned to Lynchburg, Va., apparently served in a local guard or militia, manning earthworks and gun emplacements, along the James River, on Madison Heights, in the Lynchburg area. This service, by Ivey, most likely explains his obtaining the limber chest. Additional information about Mr. Ivey can be read below. The limber chest is in fine condition. The wood is solid, and all ancillary elements, including the kick plate, both handles, the hasp and brass locking clasp and all caisson attachment parts remain. Most of the original paint on the exterior of the chest is present, as is the interior lid paint. Although the interior, shell separating panels are no longer present, one can readily see where they were, as well as the “ghost imprints” of what appear to be the bases of 3” artillery projectiles. This box has its complete, original copper top, affixed via copper nails. All interior bolt heads are covered with circular pieces of copper – serving as anti-sparking protection. The box proper is constructed of what appears to be walnut, some oak and yellow pine. The Federal issue boxes were, by regulation, to be composed entirely of walnut; it is highly conceivable that this box is indeed an early war, Confederate limber chest, utilizing copper that was available to the Confederate army only at the war’s onset. If indeed the chest is Federal, it was used by the Lynchburg local guard, so it had to have been captured. Regardless, this is a very fine example of a Civil War limber chest, in wonderful condition, with a most interesting provenance and associated use history. The Lynchburg Daily Press 1/8/10 Page 2 – J. W. Ivey dies in Lynchburg Lynchburg, VA. Jan. 7-J. Winston Ivey, aged sixty-nine, vice president of the People’s National Bank and president for six years until he retired from an active life a year ago, died today after a brief illness of acute Bright’s disease. His first wife was a daughter of Edwards S. Brown, of Lynchburg, and his second was Miss Florence Jackson, of Chesterfield County. He is survived only by three children one of whom, Winston Ivey, is a student at Richmond College. The 11th Virginia Volunteer Infantry Regiment was an infantry regiment raised in Virginia for service in the Confederate States Army during the American Civil War. It fought mostly with the Army of Northern Virginia. The 11th Virginia was organized at Lynchburg, Virginia, in May, 1861, and accepted into Confederate service in July. Its members were raised in the counties of Campbell, Botetourt, Montgomery, Fauquier, Culpeper, and Rockbridge. The unit fought at First Manassas in a brigade under James Longstreet and at Dranesville under J.E.B. Stuart. Later it was assigned to General A.P. Hill’s, Kemper’s, and W.R. Terry’s Brigade, Army of Northern Virginia. It served with the army from Williamsburg to Gettysburg except when it was at Suffolk with Longstreet. The 11th was engaged at Plymouth in North Carolina and after returning to Virginia saw action at Drewry’s Bluff and Cold Harbor. It went on to fight in the Petersburg trenches south and north of the James River and ended the war at Appomattox. This regiment reported 6 killed and 15 wounded at Dranesville, totalled 750 men in April, 1862, and lost 134 at Williamsburg and 100 at Frayser’s Farm. It sustained 63 casualties at Second Manassas, had about forty percent disabled of the 359 engaged at Gettysburg, and lost 15 killed and 94 wounded at Drewry’s Bluff. Many were captured at Sayler’s Creek, and only 1 officer and 28 men surrendered. The field officers were Colonels David Funsten, Samuel Garland, Jr., Maurice S. Langhorne, and Kirkwood Otey; and Majors Adam Clement, Carter H. Harrison, and J.R. Hutter.